Honolulu Heat opens with the Wong family enjoying another beautiful day at home in the paradise of Kauai. Suddenly a hurricane warning is broadcasted, changing the course of their lives forever. The family of three becomes four as the neighbors were away for the day, leaving their young son with the Wongs. They never made it home in the storm, so Noah became theirs. The family moves to Oahu to be with extended family as their home in Kauai is currently uninhabitable. They are happy in Oahu and decide to make it their home. Noah grows up with love and family, but as soon as he becomes a teenager his rebellious nature lands him in trouble. It starts out as small infractions. He is involved in tussles with other kids, troubles at school and disobedience at home. But there is another side to him. He is loyal to his adopted family extended family and cares about what they think of him. Unfortunately, the influence of some of his friends will soon put him on a collision course with the law. Finding himself on the run after his involvement with a murder, Noah ends up in Chinatown tangled up with both a mob boss and an extortionist, both of whom have killed many before and are in a turf war that Noah unwittingly is a part of. Noah has no place to run or hide, but when he finds out that someone he cares about may be killed, he has to try and get back to someone that will believe in him enough to help stop the violence. Risking everything, he has to prevent another murder or die trying. Honolulu Heat is a like Scared Straight on steroids. Noah makes bad choices like any kid his age, but basically he is a good kid. He feels guilty about the trouble he has brought to his family as well as his girlfriend. There are interesting subplots. The lives of the mobster and crime boss are woven into the story adding more and more tension until the last pages where the authors tie up the storylines in a satisfying end. I like the style of writing of this husband and wife team. The setting of the Hawaiian Islands is interesting and fun to read about. It is the second book I have read from these authors, but the first in this series. The story itself worked well as a standalone novel. I was confused at times trying to keep track of the the number of characters introduced. 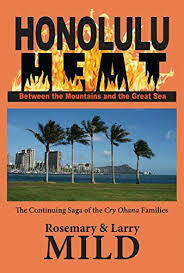 Honolulu Heat is the follow up novel to Cry Ohana and features the same characters.